I know we’re well into the swing of 2018 and through the first quarter of the year even, but I really wanted to share with you the tools I’m using to not only grow my online business in 2018 but to also get more subscribers and customers too. When it comes to finding and using online tools, there’s so much out there to choose from. I’m a sucker for new shiny things. Whenever I discover a new tool, I get really excited and want to learn more about it. Of course, if I find a tool that I love the look of, but it’s purpose doesn’t quite fit in with my goals, then I may bookmark it for the future. I think the best way to find the tools you really need to grow your blog or online business is to first fully understand what your goals are. What is it you really want to achieve with your business? Where do you want to be a year from now even? That being said, I think generally everyone wants two important things for their online business, and that’s more subscribers and more customers. So, in all it’s glory, here are the top five tools that I’m using right now to help me get more readers and subscribers to my blog, and more customers to my business. Now, I’m sure you’ve heard of most of these already. But if not, then let me dive into each one in more detail. Thrive Themes is one company that I’m always excited to hear about, especially when they are about to launch a new tool or plugin. Thrive Leads is my favorite email list building plugin for WordPress. In fact, since starting to use Thrive Leads a few years back, I’ve added over 1,200 new subscribers to my email list. MailChimp is my current email marketing service provider, and configuring it with Thrive Leads is a breeze. The real reason why I love using Thrive Leads and will continue to do so hopefully for many years to come is that this isn’t just an email list building plugin, it’s much more than that. Design and publish opt-in forms quickly. No time wasted. Create targeted offers relevant to my audience/readers based on the post topic, categories, and tags on my blog. Do simple A/B split testing for my email opt-in forms to get the best possible conversion rate. Get instant access to valuable insights, conversion reports, conversion rate charts, content marketing reports, and more. Thrive Leads has been a massive part of my online business growth and success over the last few years. Check out my full review of Thrive Leads here. At the start of the year, I decided to implement browser push notifications on Magnet4Blogging using a provider called Pushcrew. This was one of the smartest things I could have done because I’m now able to promote my content and offers to a whole new audience. I don’t have a huge amount of subscribers, mind. In fact, at the time of writing this post, I have around 900 subscribers. However, the fact that I can get more eyes on my content and offers using another medium is great. 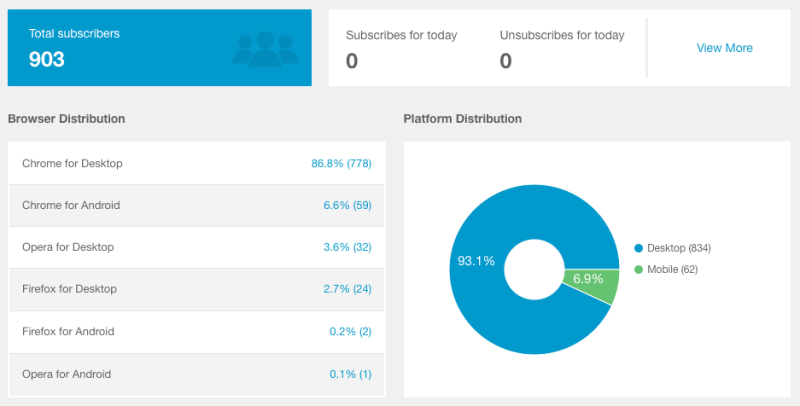 And, with RSS-to-push enabled as well, I can reach even more subscribers. Enabling Browser Push Notifications on your blog or website is something that I would highly recommend doing if you want to increase traffic and drive targeted readers and even potential customers to your website. Check out my detailed tutorial post here if you need help getting set up with Pushcrew. Another tool that I use on a frequent basis is Thrive Architect, which I’m pretty sure most of you will be familiar with by now. If you haven’t heard of it, however, then you can check out my full review and video tutorial of this plugin here. So how exactly has Thrive Architect been helping me to grow my online business? Well, for starters, I’ve been able to create several landing pages for my website that has literally transformed my business. My homepage, products page, services page, tools, and resources page, sales landing page, and email capture page were all designed using this powerful drag-and-drop page builder plugin. One of the biggest benefits I’ve found using Thrive Architect in my business is that I’ve been able to save an enormous amount of time. Being a WordPress developer, I could quite easily create some landing pages using HTML and CSS without Thrive Architect, but time is such a valuable commodity these days, and that’s what it’s all about, saving time, moving forward quickly to be able to create value and profit from your business, right? With Thrive Architect, I can create a landing page for any type of goal and design it from complete scratch, or use one of the ready-made page templates included. Notice how Thrive tools seem to dominate my list here. 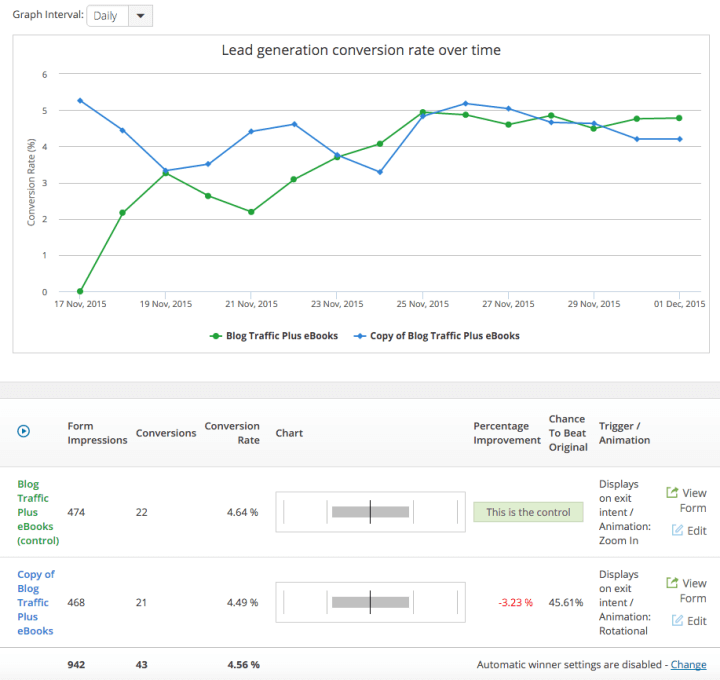 Well, that’s because all of their tools are focused on conversion design and optimization. Using Thrive tools is helping me reach my online business goals this year on an immense scale. Thrive Optimize is an add-on plugin for Thrive Architect. It enables me to do simple, but extremely effective A/B split testing for my landing pages designed with Thrive Architect. This plugin is a complete game changer. 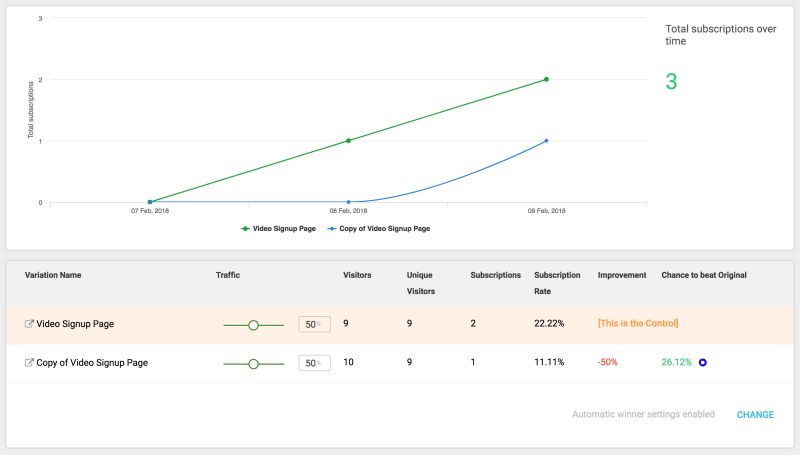 Being able to test multiple variations of landing pages from your WordPress dashboard, and have access to conversion reports and metrics is simply amazing and very powerful. I am currently running A/B split tests for my lead capture video course page, and in a few weeks time, I’ll hopefully be able to share with you the results of that test in a separate post and insightful video. Last on my list of top tools I’m using to get more subscribers and customers in 2018 is Crazy Egg. Again, I’m sure most of you have heard of it as it’s been around for some time now. I’ve only been using Crazy Egg since the start of this year, actually, but so far I’m absolutely loving it. One of my goals this year is to get a better understanding of what my visitors are actually doing on my website, and Crazy Egg is simple enough to install and configure, and so far it’s opened up my eyes about my visitor activities and engagement. 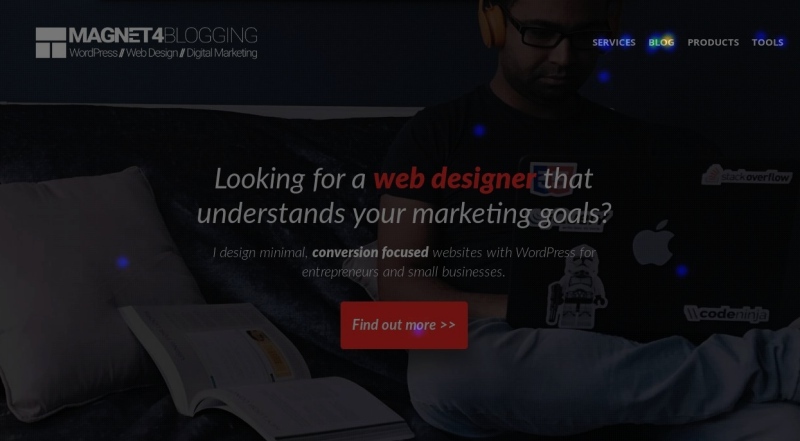 Crazy Egg provides heatmaps, scroll-maps, and AB split testing tools for online businesses. I highly recommend you signup and test it on one of your landing pages, it’s free for relatively small projects. So guys and dolls, it’s not always about finding and using every single tool you stumble upon on the internet. That’s not practical at all, in fact. If you use just two or three powerful tools to help you reach your goals, then that’s enough. I can’t emphasize enough on the “goal” factor here. You really don’t need to waste your time or money on a tool or service if you’re not entirely sure how it’s going to help your blog or business grow or benefit you in any way. OK, so I hope you’ve found some value in this post. Do let me know your thoughts if you wish in the comment section below. Are you using any of the tools mentioned above? Perhaps you’re using something else that I or the readers of Magnet4Blogging would be interested in learning more about. Again, leave your comments below.